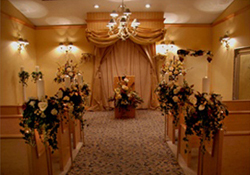 Chapel 2 offers four different wedding packages to choose from, intimate enough for two or seating up to 60 guests. All packages include unity candle ceremony and archived webcast. 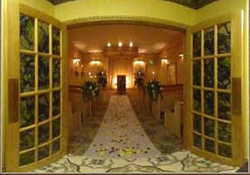 Ceremonies performed between the hours of 10:00 a.m. - 10:00 p.m. 7 days a week. With an award winning photographer, and highly trained professional staff you are assured that you have placed your special day in competent hands. Some of the elegant decor includes, large bouquet lined aisle with candles, lighted crown molding, arched ceiling, chandelier sconce lighting and solid oak pews. Every aspect of this chapel was specially designed by Iglesias Nuevo (Rio de Janeiro) to make you feel like the princess that you are, and should be on your very special day. 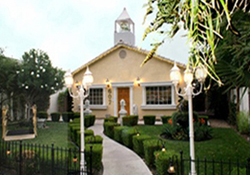 Chapel is located at 607 Las Vegas Blvd. South, 1.5 miles north of The Stratosphere Hotel on Las Vegas Boulevard. Wedding party permitted in all packages. Additional flowers may be ordered directly through chapel. Minister fee, $60.00. 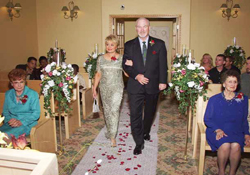 Limousine service, add $60.00 and is from your hotel, to the chapel and back to your hotel. Limited limo service area, Strip vicinity (Las Vegas Blvd.) and Downtown hotels. If unsure if your hotel is in our limo service area please call. Photographers work for tips $40.00 and up suggested. A $100.00 flower deposit may be required after making reservations. Packages do not include tax. Copyright 2015 All Rights Reserved. Chapels of Las Vegas, Inc.